Want to engage kids in science? Then DO science. Science labs are to doing science like playing scales are to composing concertos. A lot has been made of the difficulties in engaging students in science. I imagine every field has the same lament – How to do we get more kids interested in [fill in the blank]? History? Literature? Art? Math? Languages? Music? Anyone who is excited about his or her field of study wants to grab the attention of more students, infect them with passion and bring them into the fold. Science and math are the only courses students take in high school where, rather than DO the thing, they PRACTICE FOR the thing. In Art, kids make art. In English, kids write stories. In Gym, kids play sports. But in science, students never DO science. They read about science and they do “labs” to illustrate the topic they just read about. In labs, every student follows the same procedure and, if done correctly, gets the same predictable result. This is not doing science. It is not even learning how science is done. What if gym was all drills and no games? What if music class was nothing but theory and practicing scales? Well, labs are the scales of science. And six years in primary school and six more in middle and high school, all of it practicing scales, is just too damned long. If we want students to stay interested in science, we have to engage them early on in the process of doing science. DOING science means seeking answers to real world questions and using scientific information to solve real world problems. But, it turns out that that perfect storm of requirements converges with spectacular success in all kinds of classrooms. Let’s take a look at some of the ways science teachers and students can get involved in doing science. Dr Andrea Radwell and students collecting water mites (NPS). 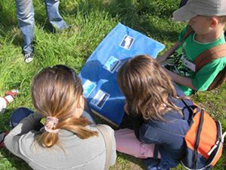 The easiest way for students and teachers to get involved in doing science is through organized citizen science initiatives. Although not full-blown science experiments, these programs offer volunteers a chance to do something that contributes to the body of scientific knowledge. 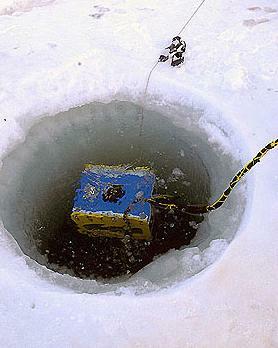 As a bonus, some of them offer a very real chance for students to make a scientific discovery. DATA or SPECIMEN COLLECTION: Where volunteers collect data and submit it to researchers for analysis. DATA or SPECIMEN ANALYSIS: Where volunteers analyze or classify data already collected by scientists. 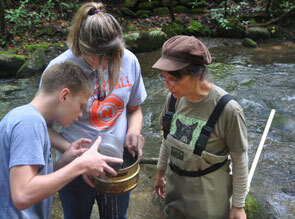 Data collection projects allow students to get out of the classroom and into the field. They are usually simple, require little in the way of equipment, and are ideal for younger students and teachers who have little scientific training. From birds to butterflies, from frogs to bees, things in the world have to be counted, catalogued and reported – not only living things, but dead things and even the undead! And not just animals. Your Wild Life wants to know what microbes are in your home and your armpits. NASA needs students to observe clouds and report meteors; Traffic Turk involves collecting traffic data using smart phones; and Public Laboratory Balloon & Kite Mapping wants citizens to use helium-filled balloons and digital cameras to generate high resolution “satellite” maps. Most data analysis projects require no special training, expertise or equipment. They are often web-based and students can usually begin after reading simple instructions or working through a training tutorial. 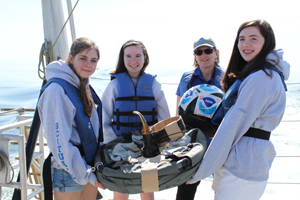 While they don’t involve field work, these projects still offer the chance for students to contribute to scientific knowledgebases. They are also an excellent way to give students real-life exposure to the kinds of data scientists collect and the difficulties inherent in analyzing that data. Some programs offer opportunity to take action as well. The Canadian Lakes Loon Survey (CLLS) monitors the breeding success of loons on lakes across Canada. Citizen Scientists collect loon information but also promote Loon-friendly lakes, build floating Loon nesting platforms, collect Loon eggs and carcasses and identify and report threats to the birds. Museums and science centers have huge collections of material, specimens, and databanks that they either need to add to or need to have analyzed. 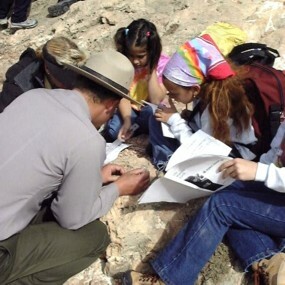 Many of these recruit students and other citizen scientists to help them. The Museum of the Earth, Mastodon Matrix project will mail your classroom a bag of 9,000 year old dirt. Students will sort, identify, weigh, and catalog items, including bits of mastodon, found in their sample. In 2011, excited 4th graders found an 8” long mastodon hair in their sample. While most difficult (and probably expensive) to set up and administer, doing real science research in the classroom is one of the best ways to involve students in long-term projects. These kinds of projects require the commitment of a science teacher or mentor who is qualified to oversee the project. At the Crossroads Academy in New Hampshire, Peter Faletra is doing just that. In his Showy Lady’s Slipper Plant Restoration Project, about 20 students in Grades 5-8 are working to repopulate woodland sanctuaries with showy lady’s slippers, a rare orchid native to the region. The students work in the school’s tissue culture laboratory and currently have over 10,000 ladies slippers and numerous experiments underway including ecological, histological and sterile culture/propagation studies. 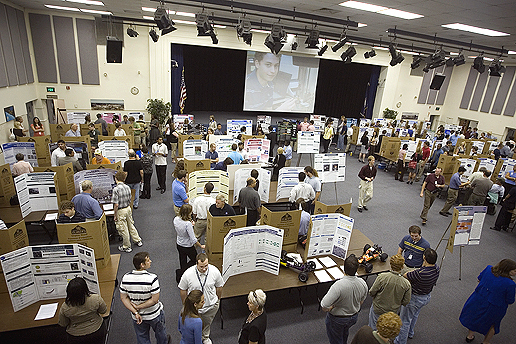 Students show and present their research efforts and results from their NASA Langley summer experience. So successful were they, that NH Heritage Bureau sent the class a seedpod of the more-endangered whorled pogonia for the students to attempt to cultivate. Read this early blog post on the project to appreciate the dedication and problem solving efforts that the students brought to the project. Done correctly, the results of student research are not limited to school newsletters and local media. Eight students working on the Crossroads Lady’s Slipper project will be presenting their findings at the AAAS annual symposium this February in Boston. The students are being accepted into the American Junior Academy of Sciences for their original research on species endangerment. In 2010 a group of 8 to 10 year old students at Blackawton Primary School in Devon, UK, not only discovered that bumble bees use a “combination of colour and spatial relationships in deciding which colour of flower to forage from,” but became the youngest scientists ever to author a scientific paper. 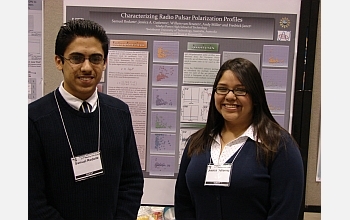 Their research was published in the prestigious Royal Society Journal of Biology Letters. Finally, there are ways that older students can take part in finding or developing solutions for corporations and government and non-government organizations. These kinds of projects can be hard to break into and require a teacher (or mentor) with specific expertise to guide and oversee the project. On the upside, if successful, some of these projects pay real money. In the Spirit of Innovation Challenge student teams use science, technology, engineering and math (STEM) skills to develop the “products of tomorrow.” As part of the program, participants are matched with world-renowned scientists, engineers and entrepreneurs as mentors to assist with advanced academic and business principles. Finalist teams receive a travel grant to present at the 2013 Innovation Summit at NASA Johnson Space Center and Space Center Houston for a chance to win a $10,000 seed grant to develop their product or service. On Innocentive, companies post important business, social, policy, scientific, and technical challenges for which they are willing to pay for a solution or ideas that lead to solution. People then submit solutions and the best solution is awarded the money. While Innocentive is aimed at adults, solutions can be provided by anyone, including students. Examples of Innocentive challenges that might be solved by students with the right mentor, would include developing a fence to keep wildlife out of the oil sands, creating a diabetic cookie that tastes like the “real thing”, developing a beverage container that keeps drinks cold longer and feels cold to the user, and finding a way to harvest the biomechanical energy from hikers to create electricity. Don’t let a lack of money stop you from trying to incorporate citizen science projects into your science curriculum. There are ways to get money for these projects. 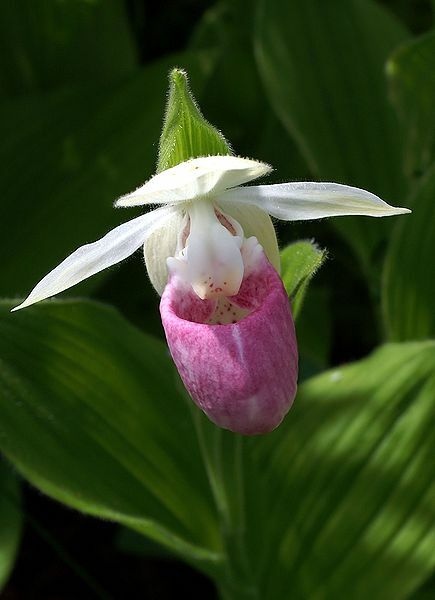 For example, the Crossroads Lady’s Slipper project received support through a peer-reviewed scientific grant from The Toyota Tapestry Program, donations from the New Hampshire Orchid Society and The Twin State Orchid Society. Teachers should research funding opportunities on the websites of the programs they are interested, especially those programs run by universities and government agencies. There may be grant money available. A few examples: The Cornell Lab offers mini-grants to help fund events that support bird count projects. Project FLOW, allows Canadian teachers to apply for funding to support water action projects in their classrooms. NASA offers grants and classroom resources. Also, don’t forget about Donors Choose, where you can post your classroom project description and funding requirements and receive donations. With a good strong social media push (especially towards the science community who want students to be involved in real science! ), you will likely get the money you need. Open Scientist : Projects from the world of Citizen Science. SciStarter: the place to find out about, take part in, and contribute to science through recreational activities and research projects. Cornell Labs Citizen Science Central : Listing of museums and science centers that have citizen science programs. Zooniverse: home to the internet’s largest, most popular and most successful citizen science projects. 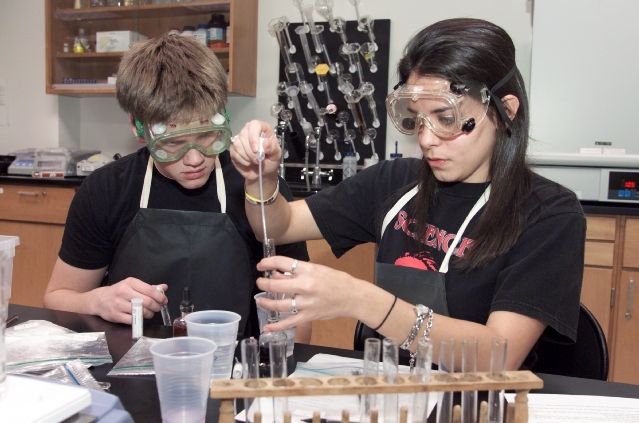 American Junior Academy of Sciences: the only national honor society recognizing America’s premier high school students for outstanding scientific research. ** Quoted excerpts taken from Ellie Pschirrer-West, 8th Grade Graduation Essay, Crossroads Academy. Used with permission. Ellie presented the results of Crossroads’ Lady’s Slipper Project at the 2012 AAAS Meeting in Vancouver. NextHead off the Holidays with Kim’s Solstice Step Up Challenge! Great blog, Kim. And what you are saying is that we need more engaging teachers in science (and everything else as well.) And we need to convince everyone that science is not about answers, but about defining problems and trying to figure out how you go about finding answers. Too many still want to look up the answer in the back of the book. As a student who has been bored out of science to the point where all i want to do is get the work done and out of the way, i agree that teachers should give examples of a given subject through experiments in which the students can engage in physically. I find that using elaborive rehearsal in the form of experiments, i can absorb the material into something meaningful rather than just repeating information until it sticks into my long term memory. Elaborative rehearsal significantly improves and makes room for a lot of new material. This is very important for students because if they have meaningfully applied info in a situation, they are more likely to recall it later. I just hope that someday, the right teacher comes along and is able to re-ignite my interest in science through labs. Thank you for your great comment! You didn’t say how old you are, but it doesn’t matter. All that matters is that you want to be interested in science but you’re having trouble with that. So here’s the thing: You don’t need to wait for the right teacher to come along. Most of those projects and ideas I wrote about, you can do on your own! Just find one that looks interesting and go for it. See, that’s the beauty of living in the future! Students today have access to anything they’re interested in. You can do science projects in your own at home, take online college and university classes (for free! ), watch videos and tutorials if you need help, and find out about bigger, more important projects that you can join and help with. The other thing you can do is find a great project and bring it to the attention of your Science teacher. Who knows, he or she might just love the idea! Come back and let us know if you take on one of the projects. We’d love to hear about it. Thanks again for commenting.